TyAnthony Davis Creates Vox Collegiate for Grades 6-12; Davis will build student voices through his new charter school in Watts. TyAnthony Davis, 29, is starting his own charter school in Watts. After a recent LAUSD board meeting, Vox Collegiate was approved and will be open in the Fall of 2018. Davis grew up in Fresno, CA. When he was in fourth grade, he got the opportunity to join a school for gifted children. That experience changed his life for the better by giving him a more rigorous curriculum and higher expectations at a young age. After high school Davis attended Yale University where he played football and received a bachelor's degree in African American Studies. After graduating, Davis joined Teach for America and started teaching fourth graders in Las Vegas. He received his master’s degree in the process but had a yearning to go further. He went to Harvard to get his juris doctorate but still had a place in his heart for teaching. 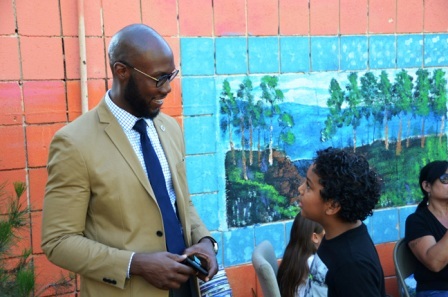 After two years of practicing law in Los Angeles he decided that it was time for him to start his own school. Vox Collegiate will cover grade levels 6-12. The school will start with an enrollment of 105 sixth graders and continue to enroll new sixth graders each year. The school will focus not only on academic skills, but also skills that students will need to be successful in any career. Students will be given courses on communication and evaluation. There will be classes on speech, social advocacy, community engagement and more. Davis is also particular with the teaching style. Through football he learned about creating trust and partnership with students. He wants his students to trust that when the teachers are having high expectations, it is because they believe in the students and are going to do everything to help them reach that goal and standard. Davis will use the following year to enroll students and finalize everything for the school that will open in Fall of 2018. For information on how you can get involved, visit www.voxcollegiate.org.